This article explains the Rose of Leary by Timothy Leary in a practical way. After reading you will understand the basics of this powerful communication skills tool. What is the Rose of Leary? Do difficult people exist? This basic question immediately leads to another question. Why is certain behaviour perceived as difficult by other people? To get a better understanding of this perception, psychologist Timothy Leary distinguished four basic behaviours, which he subdivided into nuances. It’s called the Rose of Leary. In the Rose of Leary it is not about the typing of human nature but rather about getting a clearer understanding of the impact of behaviour on others and the interaction between people. According to Timothy Leary, people do have a preference for a certain type of behaviour. In order to clarify human behaviour and the interaction between people, Timothy Leary developed a communication model, name the Rose of Leary, based on a horizontal and a vertical axis. The horizontal axis focuses on relationships with others and the vertical axis focuses on attitude to others. The four directions form a rose from which the name of Timothy Leary ’s theory has been derived. He referred to the north axis as the above behaviour, the south axis as the below behaviour, the west axis as the ‘opposed’ behaviour and the east as the together behaviour. Timothy Leary distinguishes additional nuances in these four basic behaviours such as above- together, above- opposed, below-together and below-opposed. Above behaviour is about active, initiating and leading behaviour. The degree of dominance is determined by the other party. Below behaviour is about submissive behaviour, the individual does not get involved, effaces himself or displays very modest behaviour. Opposed behaviour is about people who are aggressive and do not agree with other people unquestioningly. They want thorough explanations and motivations before they take action. This could develop into defiant behaviour. This is about an ideal situation in which people can work as a team and in which people are receptive to other people’s opinions. Timothy Leary assumes with the rose of Leary that people tend to respond with complementary behaviour to behavioural variants, in which one type of behaviour triggers another type of behaviour. On the one hand this has to do with the human instinct; on the other hand this has to do with influences from the environment. Unconsciously we are inclined to respond submissively to above behaviour and we let ourselves be guided and controlled by this. Unconsciously we are inclined to display leadership behaviour when we interact with people who display below behaviour, we are inclined to take them by the hand and control them. Unconsciously we are inclined to react more critically when someone else is critical and we are even inclined to agree with so-called defiant behaviour. Unconsciously we are energized by working together in harmony. It stimulates us to continue doing our work and to listen to other people’s opinions. It is only after becoming aware of the complementarity theory, that it is possible to resist this unconscious control. Timothy Leary provides points of reference but he also emphasized that each person responds differently. The best application for each behavioural variant is to use the opposed variant above-together. Without putting the emphasis on dominance, this behaviour adopts leadership soft skills so that cooperation can be achieved. By giving the right feedback people, who are inclined to display above behaviour, opposed behaviour or below behaviour, can be corrected and encouraged to cooperate with each other. What do you think? 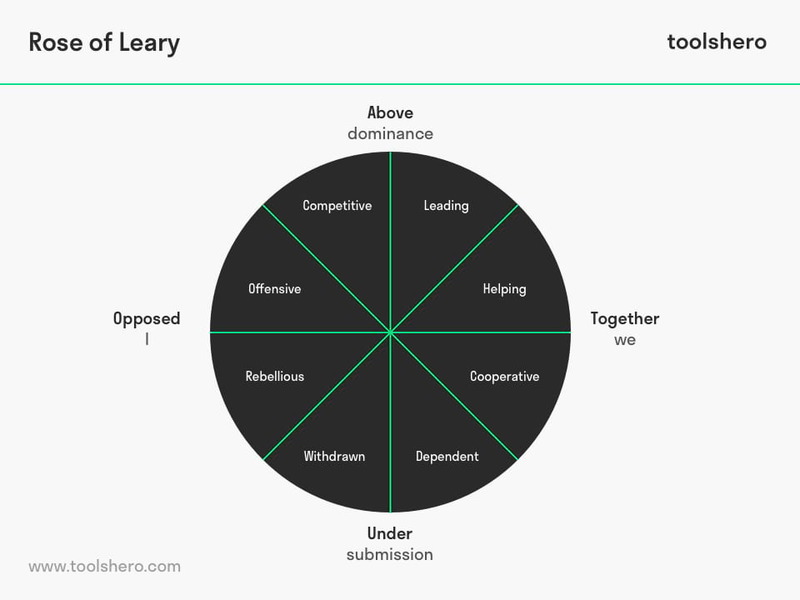 Is the Rose of Leary applicable in today’s modern companies and people development tools? Do you recognize the practical explanation or do you have more suggestions? What are your success factors for self analysis and team development tools? Leary, T. (1957). Interpersonal diagnosis of personality. Ronald Press.